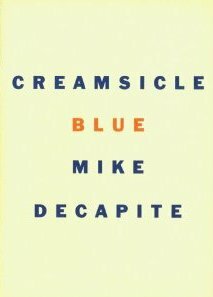 Mike DeCapite's writing fascinates me for being both impossible to stop reading and impossible to pinpoint. His latest chapbook, Creamsicle Blue, (which I reviewed in January), is a 27 page piece of nonfiction with the scope of a novel and the depth of a meditation. 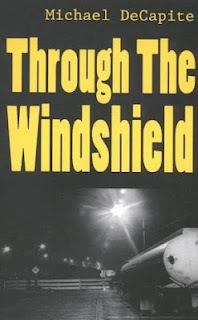 He's also the author of the novel, Through the Windshield (Sparkle Street Books), the unpublished novel Ruined for Life!, and the chapbook Sitting Pretty (CUZ Editions). Recently I asked him some questions about writing. K: I was particularly struck in Creamsicle Blue with how closely entwined I found the writing and the living. Not merely that it was “autobiographical” but that you were walking through your life hand in hand with writing: The consciousness born in writing mattered to your life and your life lived mattered to the writing. Are you a “daily writer,” or do you think the practice of writing is more than just what happens between pen and paper? M: I don’t write every day, not anymore, but I’ve developed a form that’s open to chance, that allows me to write things down as they happen. If I’m working on something, I’m working on it all the time, although days and even weeks might go by without my writing anything down. Since quitting smoking a few years ago, I have an aversion to sitting down at a table with a typewriter or computer. It’s the last thing I want to do. I’ve dismantled all my rituals around writing, and now I just write on the fly, wherever I am. So now more than ever, writing is more for me than just what happens between pen and paper. I feel like I’m living inside what I’m working on, gathering observations and bits of conversation, climbing up a ladder to add a detail here or there. Since my work is no longer localized at a green Formica kitchen table in Brooklyn, it’s generalized. Wherever I go, I’m in it. It’s a daydream. And as I get older, I’m less and less inclined to betray the dream by putting it into words. It’s so pleasant to go around in the dream. I’m trying very hard to avoid saying I’m lazy. K: When did writing enter your life and what made you start? Did you explore other art media along the way, or was it always writing? M: I’ve never explored another medium since I started writing in earnest, in my late teens. The first book I wrote was a book of journals when I was 18. I wrote it as a book, typing it as I went and showing it to my friends, with an idea that it would somehow be published when it was done. It covered a year, October 1980 through October ’81. K: You’ve said that “Creamsicle Blue is as close as I’ve gotten to the kind of thing I’ve always wanted to do.” How would you describe that thing? How did it show up in your earlier chapbooks or books? M: I don’t have any interest in telling stories. Which, let’s face it, is a handicap in a writer. Even Through the Windshield, which is full of stories, isn’t interested in telling a story. It imagines the novel as flat surface, like a painting or mosaic. That book has a dailiness, a diaristic quality, a feeling of the sufficiency of now. It stops time. It’s a place to go, that book. Because it doesn’t go anywhere. There’s no plot, so there’s more room for food and weather and the way the city looks at night and stray, momentary feelings and bits of reverie. Anyway, without especially trying to, it gets past linear time. My second (never-published) novel, Ruined for Life!, attempts the same thing in a more deliberate way and with less success. It does compile a lot of different textures: narrative, journal entries, conversations, essays, prose poems, notes. But it’s not as disjointed as I envisioned it, and it turned out to be fairly linear after all. Creamsicle Blue, I hope, manages to be nonlinear while still describing an arc. The form of it I developed in a column I was writing for a couple of years for a magazine in Cleveland called angle. 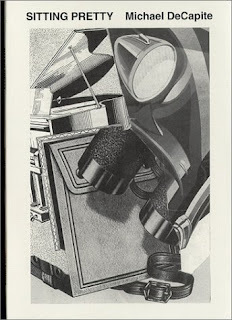 I was living in a little room in San Francisco, drinking a lot, between drafts of Ruined for Life!, which I hadn’t even been able to look at for a couple of years. I didn’t think I could write anymore, I’d drunk the ceiling down on my imagination. And I knew a woman in Cleveland, a poet named Amy Sparks, who was starting an arts magazine with two other people, and I heard myself ask her if I could write a column. I told her I’d write a monthly weather column. Figuring everything’s weather, so I could write whatever I wanted. And she said okay. I only did it to get myself back in shape to write another draft of Ruined for Life!, but that column became the only writing I’d been happy with in a long time. It was called Radiant Fog. I wrote maybe fifteen or twenty of them, just going around with my eyes open, leaning on street corners and sitting in bus stops, collecting details and piecing them together till they took on some life or pull of their own. And after I quit writing for the magazine I continued to write in that form. K: As a reader or a writer, how would you describe the sometimes-fine line between autobiographical fiction, memoir, creative nonfiction, and fiction based closely on life observations? Why do you think poetry is rarely tagged as autobiographical? M: I don’t know what they mean by creative nonfiction. All writing is creative. I think it’s an attempt to put a literary shine on a piece of nonfiction. Or it means a book is entertaining even though it’s nonfiction. It’s reassuring. And I guess in creative nonfiction you’re not writing about yourself, and in autobiographical fiction and memoir you’re writing about yourself. Autobiographical fiction is a label someone else sticks on you. No one says, “I write autobiographical fiction,” right? Who wants to say that? I just call myself a writer. All writing is imaginative work. You can use your imagination to invent a world or to illuminate the world around you. I do the latter because that’s what I’m better at—it’s my natural inclination. It’s just a matter of what your interest is, as a writer, as a reader. I guess poetry isn’t tagged as autobiographical because that’s its default position. Which isn’t true of prose. K: Which writers or books stood out for you or influenced you along your path? What did you see they were doing that excited you? M: Celine, for the directness and intimacy and force of his voice, and also for the speed and jumpiness of his style. James Agee’s Let Us Now Praise Famous Men, with its variety of textures and Agee’s statement near the beginning that if it were up to him, the book would be just pieces of wood and iron, and bits of cloth and food and excrement. Sometimes it’s not even a book but just a line. Exterminator! [William Burroughs], for instance—just the words a novel on the front—I can still see them, next to the big roach: that classification in itself was inspiring! You open it up and it’s all these unrelated short pieces, but on the front it says “a novel.” So that forces you to do some reassessment. It’s a novel because he had the nerve to say so. A book like Naked Lunch shows you that you can put whatever you want between two covers and call it a novel. Which is true back to the beginning of the form—look at Tristram Shandy. Nothing’s more freewheeling than that. But my influence from books was secondary to my influence from music. I probably got more from Freak Out! or Lumpy Gravy than I did from The Wild Boys. With music you get it right away, what’s cool about cutups and collages, why this works. Also from music I got the idea of standing up there and singing your song, if you know what I mean. Rather than fooling around with fiction. For which I’m unsuited anyway. If I had to pick one signpost work, it would be “Tangled Up in Blue” or “Where Are You Tonight?” My whole life, those songs. And what Dylan does later, on Time Out of Mind and Love & Theft—that method of conveying information—that method of composition, taking lines from here and there—is exactly what I’d like to be able to do in prose. That method of narration. Nonlinear, cinematic. This quality is always called cinematic, but songs do this kind of thing very naturally and no one seems to notice. The way old blues songs are put together, with verses chosen here and there from a common pool to supply a rhyme, is much more radical and nonlinear than works that set out deliberately to play with narrative. The guy’s in Georgia, he’s in Tennessee, he’s lost his woman, he’s got a woman, she’s an angel, she treats him like a dog, and when he gets in a jam for a rhyme he goes down in the ocean and sees the crabs doing the shimmee shee. And this method does a better job of describing or hinting at the dimensions of experience—the dimensions of a mind, a life—than loading the work with every memory and sensory detail, which would be a common inclination in prose. Songs like “Trying to Get to Heaven” and “Not Dark Yet”? Doesn’t get any better than that. All those images, all those scenes. Those songs, rather than summing up a life, suggest its dimensions—while retaining its richness and leaving its mystery undisturbed. Dylan doesn’t even confine himself to his own era. “I was riding in a buggy with Miss Mary Jane.” How’s he get away with that? I don’t care how much he steals—that’s part of the point of what he does, it’s part of the meaning of those songs, and it’s part of their effectiveness. Well, that’s enough about Dylan. Van Morrison’s song “St. Dominic’s Preview” was a big inspiration for Creamsicle Blue. The way he goes seamlessly from washing windows while listening to Edith Piaf to Paris in the first verse, the way he jumps around in time. Great, great song. I’m more excited by works that are put together than by works that are written. But I’m not sure that influence is anything more than confirmation. It’s a reminder of what you already know. Maybe encouragement is more a more accurate term than influence. Certain works encourage you to trust your instincts. And you’re influenced by your own work. You write something that leaps forward, ahead of where you are, and then you write to catch up with it. You can find excerpts from DeCapite's novel Ruined for Life! at spots around the web, including these chapters on the blog Boogie Woogie Flu and the litmag Sensitive Skin. Hello Karen - I'm now subscribed to your blog! Such a great interview--full of excellent brain nuggets!